Leadline-done right! Lauren should be sporting the hat and dress. 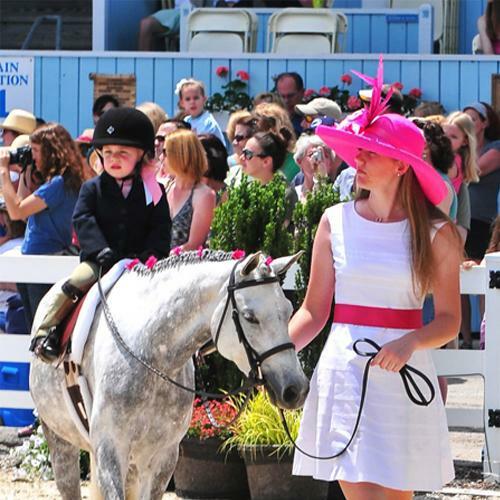 We are less than a week away from Jordyn’s biggest horse show of all, the Pin Oak Charity Horse Show, which has been held in the Houston area for almost 70 years. It is a charity show with proceeds going to Texas Children’s Hospital. For many area equestrians, it is the cherry on the top of sundae. Lauren has shown and competed for many years in Houston and only once has had a horse worthy and ready for Pin Oak. She will not have a horse at the show this year. First, although certainly a worthy cause, it is still expensive. Along with expensive, I am a bit of a gambler by nature and I want the odds in my favor. Not only do the riders pay more for the privilege of showing their horse at the great Pin Oak show, but because of its inherent popularity, more riders want to come. The classes are huge, so the odds of being the very best or the very fastest are lower. This is also why a Pin Oak ribbon is valued above all others in Texas. It says you have ridden against the very best and come out ahead. Included the multiple week’s activities are International Hunter Derbies with prize money of $10,000 and the biggest draw of all, is the Grand Prix pulling top national and international riders with the promise of $25,000 in prize money to be won twice during the show. It is the grand-daddy of all the Texas shows. Okay, so you get it. It is a big, exciting show. I am more than a little delighted to have a family member participating this year. I wish Lauren and Feather or, goodness sake, Lauren and Big Bruno were making their way through the entry gate but I am quite content and thrilled for it to be my oldest granddaughter, Jordyn who will hear her name called out to the packed crowd on Thursday night. I am thankful that our friends, Kathy and Caitlyn, have offered up an all-star mount for Jordyn to ride. In this contest of little skill and a lot of pomp and circumstance, the pint-sized rider is dressed as a miniature equestrian with all the trappings of a pro, including jodhpurs, boots, show shirt, tiny wool tailored jacket and black helmet. The horse has its mane and tail braided elegantly and its coat is polished like a new penny. Nothing is left undone, including polish on the horse’s hooves. Every piece of tack from bridle to the inner pieces of the tiny saddle are saddle-soaped, oiled and polished to gleam in the evening lights. The handler (Lauren) is outfitted in either a fancy dress and hat (which we have already ruled out) or their formal hunt garb. 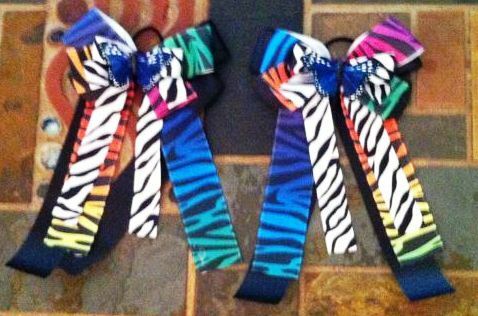 The fancy bows (they are about a 8-inches long) that Jo will wear in her hair! When the class is called, the rider will enter the arena mounted on their fancy horse or pony, led (thus the leadline) by the handler. At no time, is the little rider allowed off on their own and it should be a sedate but touching sight with the little ones all dolled up on beautiful horses. The pairs parade around the ring a couple times and magically there is a tie between all riders who then collectively win blue ribbons! Adding to the fun for us, is that Caroline and her daughter, Abby, also five years-old, are joining Lauren and Jordyn. Abby will be on her beautiful white pony, Princess. Tomorrow with Jordyn, we will go to the Equestrian Center where the horses are already stabled and showing in the event, so we can be sure her saddle fits correctly. I know Jordyn is beyond excited to be part of the big event and can’t wait to meet her partner. As you can see from the picture above, there is a whole color coordination thing going on, so Ally has been on a hunt to match the bows that will be in Jo’s hair come Thursday night. We will have some matching zebra ribbon braided into the horse’s mane so he and Jo are a united front. If only I could get Lauren to wear her hair in pig-tails with bows to match. How great would that be? There are always tales, almost horse show folk lore, about things that happen in Leadline classes. Ponies with one foot in the grave, quiet as a mouse somehow can become electrified under the lights. I am hoping for a nice, calm trip for all the little riders. I did hear a story once of a little boy whose mother was way more into the whole Leadline thing than he was (I can’t imagine that!). During the time while they were lined up for the judge, the little boy quietly slipped off the other side of the horse and headed out of the arena. I don’t think that will be an issue with either Jordyn or Abby. If you are out near Katy, Texas early Thursday evening, stop into the big arena and watch these two little girls earn their first Pin Oak blue ribbon. I bet it will be the first of a future at Pin Oak! Can’t wait to see the pics! Good luck Jordyn!